President Trump’s 2020 budget, released on March 11, is a proposal that would make deep cuts to core public services and social safety net programs, increase poverty, worsen income inequality and racial disparities, and add millions to the ranks of the uninsured. These proposed cuts seem to be in the name of fiscal responsibility, however making permanent elements of the 2017 tax cuts that disproportionately favored our nation’s wealthiest also added $1.5 trillion to the federal deficit. While unlikely to be approved by Congress as proposed, this budget offers a stark image of this administration’s priorities when it comes to the improving the lives of families across the country. 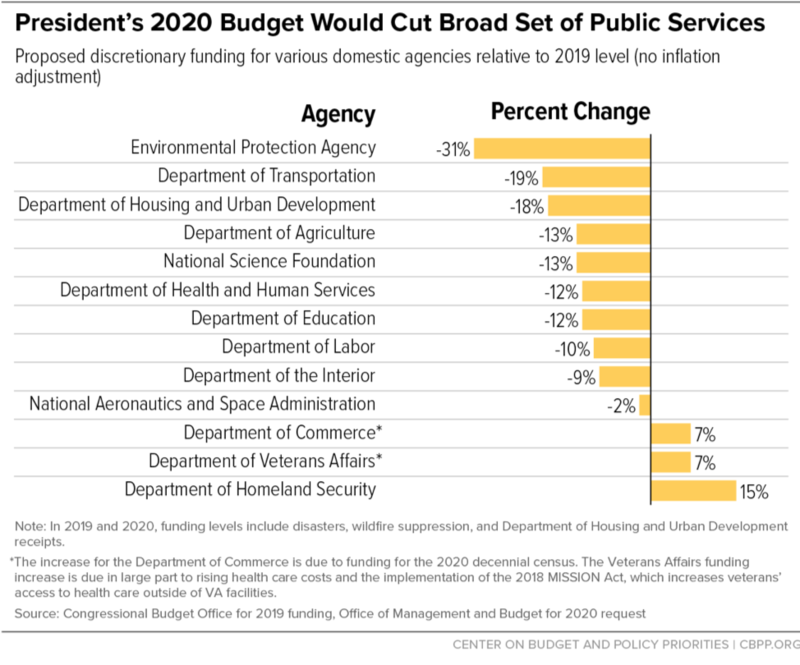 The Trump Budget proposes steep cuts across a broad set of public agencies, as shown in the chart below. While the administration has said that the cuts amount to an average 5 percent reduction in domestic spending, the Center on Budget and Policy Priorities has found that to be a misrepresentation, with the actual reduction amounting to between 9 percent and 11 percent. Hundreds of thousands of Montanans rely on these safety net programs to be able to afford groceries, healthcare, housing, transportation, and more. The deep cuts proposed by the Trump administration will inevitably harm thousands of Montanans struggling to make ends meet. Additionally, the Trump Administration is proposing structural changes that would limit programs’ capacity and strip benefits from millions of vulnerable Americans. Foremost of these proposals is an ill-defined uniform work requirement across federal government assistance programs like Medicaid, SNAP, and housing assistance administered by the Department of Housing and Urban Development. Harsh work and reporting requirements overwhelmingly serve to strip assistance from eligible Americans by forcing them to navigate a new, more complicated bureaucracy. It has been shown time and time again that strict work and reporting requirements do not help people find jobs. On the contrary, loss of coverage can make it nearly impossible for people to remain healthy enough to work. In Arkansas, the first state to implement a Medicaid work requirement, one in five people subject to the restrictions lost coverage within the first seven months it was in effect. A Medicaid expansion work requirement currently under debate here in Montana could kick up to 56,000 people off of their health coverage. Estimates show that between 1.4 million and 4 million people would lose health coverage under a national Medicaid work requirement if enacted. In 2017, social safety net programs lifted 36 million Americans above the poverty line—a 44 percent reduction. Additional restrictions and deep cuts that are presented in this proposed budget will have real impacts on millions of vulnerable Americans struggling to get by with funding levels as they are. Beyond simply slashing domestic spending on crucial safety net programs, the Trump Administration again signals a move to repeal the Affordable Care Act (ACA), proposing to replace it with legislation modeled after the Graham-Cassidy proposal, which was rejected by Congress in 2017. This move would strip protections for people with pre-existing conditions, cut off federal funding for Medicaid expansion, and replace funding for ACA insurance subsidies and Medicaid expansion with an inadequately funded block grant system. This block grant system could cost Montana up to $1.5 billion in federal funds and leave the state unprepared to deal with health crises caused by epidemics or natural disasters. Such a measure would be devastating for hundreds of thousands of Montanans either enrolled in Medicaid expansion or receiving ACA insurance subsidies, and would also hit Montana hospitals, which have been given a lifeline in the form of federal Medicaid dollars. Permeant tax cuts for the wealthy and large, multi-national corporations do little to benefit the lives of most American families and added $1.5 trillion to the federal deficit. In a weak attempt to balance these cuts, the Trump budget takes massive cuts to the cutting the very programs that millions of Americans rely upon to make ends meet. While this budget proposal does not have immediate policy implications, this is yet another example of the Administration’s priorities. 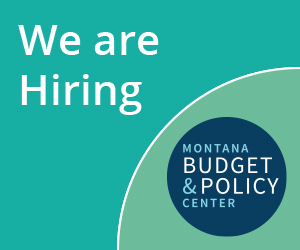 MBPC will continue our work at both the state and federal level to inform and advocate for policies that help make the lives of families living on low-incomes easier, not harder.